I suspect as a tool for creating animations, using bitmap images, Pencil is ideal. There's much less to go wrong. On top of that you could choose to edit all your frames in any bitmap editing software you choose then just import them into Pencil, add some sounds, export to a movie file and you're done. If that's all you need to do I highly recommend this software - its free - so give it a try. Once you get into vector animation the frustration starts to set in. Specifically with the vector 'area fill' tool. If you haven't properly closed an area you'll keep getting a warning message telling you there's a gap in your drawing or you've 'Zoomed Out too much'. This is a known problem that is documented within Pencil's manual. It's frustrating because often there are no obvious gaps - even if you zoom right in to check. I've found that larger areas are likely to trigger this warning. If you can't find any gaps then the best solution seems to be to break the area up into smaller fill areas using the 'invisible line' tool. Then fill each section as you go until the area is all filled. Because of the buggy nature of this software, personally I wouldn't use it to create anything too advanced like a full vector animated movie. However if you're just looking for some vector animation software to create scalable, animated props, heads and backgrounds for your GoAnimate movies this is a good stop gap until you can get your hands on something better. Pencil features a nice 'onion skin' tool that allows you to import a bitmap image onto one layer then use the vector tools to trace it - as I did with my animated campfire prop below (you may need to click on the image to see the larger version and my vector lines traced over the bitmap image). By converting the bitmap animated campfire into a vector animated campfire it will now look great in any scene without becoming pixelated if you zoom in for a close up. You can see the fully animated version of the campfire in Deer Hunters Creek. Pencil creates animation through the use of Key Frames. This is great because it means you don't have to draw everything on every single frame. For example, with my campfire I drew the rocks onto one key frame then, over the next ten frames I only drew the fire (which obviously had to move on every frame to look like, well... fire). If you look closely at the image of the campfire above you can see along the bottom of the screen there is a time line featuring two Vector Layers. Within that time line there are rectangular boxes. Each box represents a key frame. 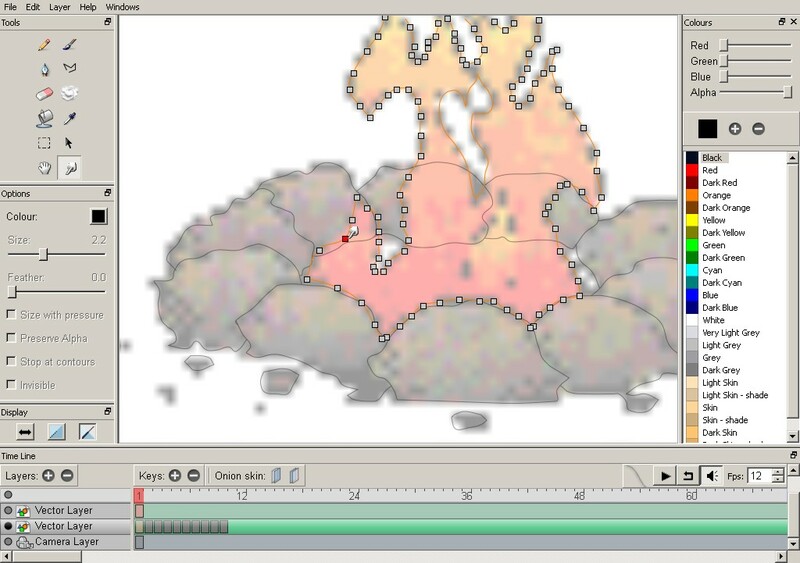 On the first vector layer there is one key frame for the campfire rocks. On the second there are ten frames for the fire. You'll notice there is also a camera layer in the time line. This layer is used to size and frame your various 'shots'. Just like other layers you create key frames for the different camera shots. 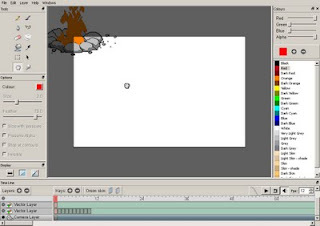 For GoAnimate users you'll need to create a camera layer for your object with just one key frame. The camera size should be the same size as the GoAnimate Studio Stage (550 x 354 pixels). You'll then need to size your object relative to how big you want it to be (initially) compared to the stage (generally it's best to make sure your object always fits within the stage. You can easily make it larger once you've imported it onto the GoAnimate Stage). You'll then need to position your object in the top left corner of the stage with the corner being approximately in the middle of the object as shown below. (If you're creating a head prop then the top left corner of the studio is roughly where the neck of your characters body will be). From there you simply export the file as a Flash/shockwave file (you will have to add the '.swf' extension to the file name yourself) ready to import into the GoAnimate Studio. Note that for any GoAnimate users thinking that Pencil would be great for creating fully fledged GoAnimate compatible characters with, unfortunately you're out of luck. Whilst it's great for backgrounds, animated props and heads, it cannot save files in the correct format for characters. Despite it's short comings I've used Pencil to create all my vector based props on GoAnimate. Sometimes I drag my feet thinking, oh no, I don't want to use pencil again, but, unless you want to buy some software, I haven't come across any other free vector animation software compatible with GoAnimate. Like I said it's a good stop gap. If you find yourself using Pencil a lot and you're really interested in flash animation then you'll probably want to buy something better eventually. That aside, for a free program it really does have potential. 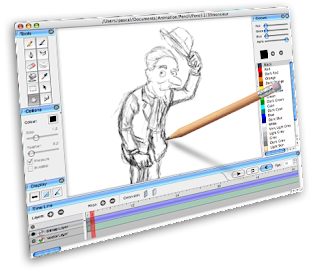 The drawing tools are quite basic but, with enough patience, you really could do some very impressive animation work. Awesome. Great review. I tried out pencil and found it frustrating. Possibly for the reasons you mentions. I can't quite remember. Just wondering, is it only for BETA users? Not sure what you're asking Panda Boy? Pencil is free software for anyone to use. If you're asking if only GoAnimate Beta users can upload flash props etc. then I'm not sure. I think that is still the case but you would have to check with GoA's staff. One thing that really impressed me was the smoothness of the pencil when drawing. I've worked with high-end animation and drawing programs that don't bother applying an iota of smoothing to drawn lines, leaving you with a grainy, pixelated mess. Flipbook softens that so that, if you're working with a fine enough line, it feels almost like drawing with a real pencil. I haven't used Pencil much for freehand style drawing but it really does create some very smooth lines. Wish it was a much more complete program though. Once you get a feel for what's likely to cause the program to crash you can minimize the annoyances. I try not to use Pencil for anything too complex simply because I'd probably end up hitting it with a baseball bat too. This was really great information given by you, and I think that it's main objective is to make traditional animation, pencil is designed to be a simple program that allows anyone to make 2D animation. All the comments makes me not to download it. We don't need to draw on a piece of paper and spend lot of time and effort to finish and scan it. With the help of this software, we can directly save it to our computers and improve it. I just wanna ask if this software work on windows 7? Nice tip. I find this one useful as a beginner and I was able to make my first transparent image. That is main objective is to make traditional animation and use of pencil design, just amazing.